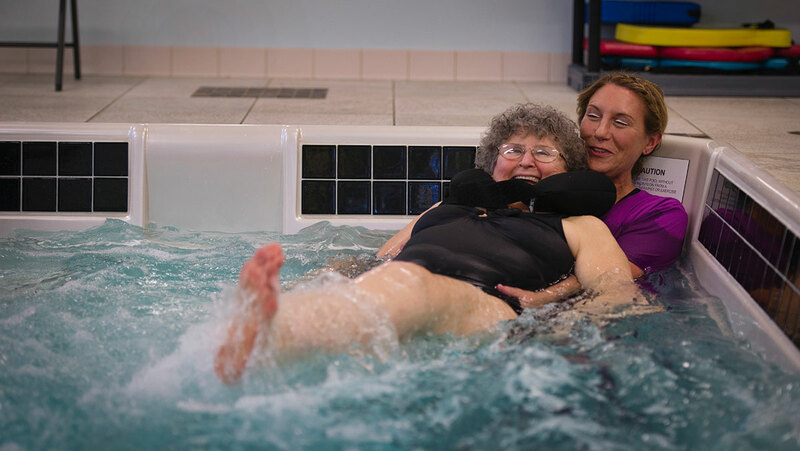 Paramount Rehabilitation Services offers one of the few therapy pools in the Great Lakes Bay Region. The water reduces stress on joints, making it an effective treatment method for both chronic illnesses and injuries. During therapy in a pool, the warmth of the water encourages muscle relaxation and blood flow to injured areas. The buoyancy of the water reduces the amount of weight bearing through the body, resulting in less pain for the patient and making it easier to complete exercises. While exercising in the pool, water resistance enhances strength training. Feel secure at Paramount as our therapist is in the pool with the patients at all times. Our lift chair makes it easy to enter and exit the pool without stairs. A platform allows patients to stay in a shallow area of the pool. During aquatic therapy, we use specialized treatments to increase cardiovascular function; decrease swelling; build range of motion, flexibility, balance, coordination, muscle tone, and strength. One prime way we do that is with the use of an underwater treadmill and underwater cameras. The treadmill assists with gait and the functional ability of the body. The cameras connect to a screen so patients can see what is happening and make corrections. After treatment, we use underwater jets to provide deep tissue massage that eases muscle soreness. If you’ve had a Total Hip Replacement, Aquatic Therapy can help decrease pain and tightness while strengthening the hip joint, spine, and core muscles. Based on your needs and comfort level, we can use aquatic stretches and massage to decrease post-surgical pain and tightness. After a Total Knee Replacement, Aquatic Therapy helps improve flexion and extension. We can reduce swelling and tightness through stretches and massages of the hip, hamstring, quad, and calf. Once post-surgical swelling goes down and your range of motion increases, we can progress through strengthening and balance exercises.